The synonyms for infinity are: everlasting, forever, perpetuity. In my book INFINITI translates as a tenuous grasp on survival. Toyota launched its upscale LEXUS brand in the USA in September 1989, complete with a published set of brand values, detailed dealer training, stand-alone Lexus dealerships, and a company-wide commitment to ensure Lexus had both the credentials, the cash, and the ongoing will to seriously challenge all the existing players in the Upper Luxury segment of the passenger car market. It always remained seperate to Toyota. I was PR VP for Jaguar Cars North America at the time, and the appearance of the whole Lexus bulldozer caused us (and our fellow European competitors) a few sleepless nights. This car was GOOD! And backed by everything it needed from the Japanese giant. Just two months later, in November 1989, Nissan fired back with its own version on the top end of the market, which it bravely called INFINITI. I have previously written about the birth of the Lexus concept, and the rigorous program to create and nuture the LS400 project, the sole survivor among five different initial programs - pursued by teams with no budget nor any technical limits. I admire Toyota for sticking with the original principles and targets it set for the Lexus brand. It has not deviated in its approach. The model line-up has grown steadily since the original LS but the core principles have not moved. It is a project, the type of which has rarely been witnessed in automotive industry history, and it was - and is - a near-total success. Today's Lexus lineup may not be the most attractive, but it does have a unique identity. Compared with the the billions of dollars Toyota eventually spent on bringing Lexus to market, Nissan’s financial investment was chicken-feed, using platforms and powertrains borrowed from a range of existing Nissan models for the 'exclusive' Q45. 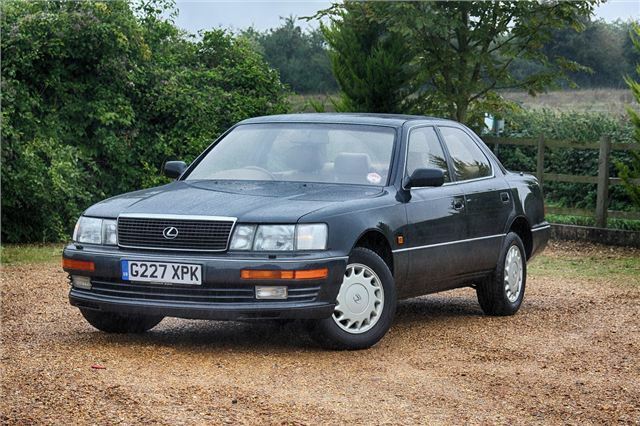 It was a cheapskate response to the integrity of Toyota’s approach with its Lexus LS400. 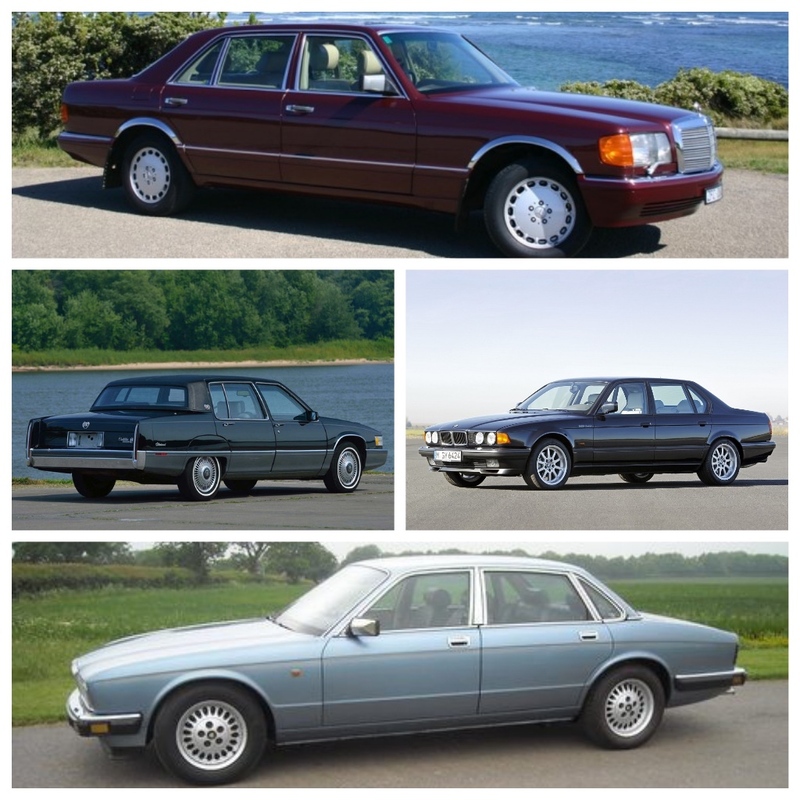 As such, I have long held the view that Infiniti was an ‘expensive pretender’, and certainly my early test drives of the original Infiniti Q45, and the Lexus LS400 revealed the extent of Nissan’s artifice. 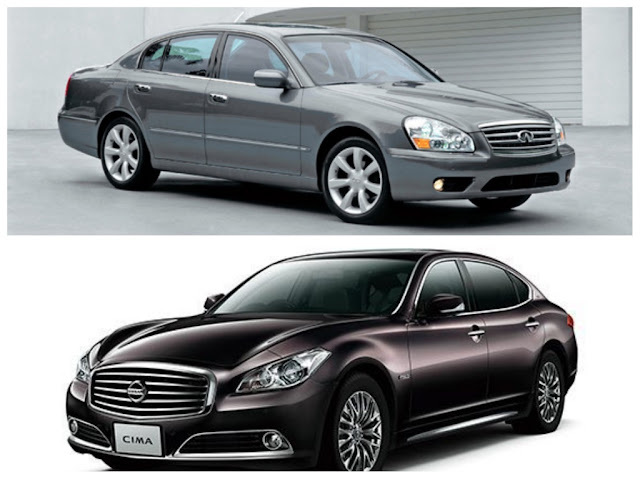 In effect Infiniti was masquerading as a high-pricetag challenger to Mercedes-Benz S-Class, BMW 7-Series, Jaguar Sovereign and the Cadillac Fleetwood - and the Lexus LS400! Believe me, it was no threat to any of the established players, nor Lexus. Sure, the cars may have gradually improved since 1989, but they are still running on ‘shared’ Nissan platforms with existing powertrains. Despite all the fancy chrome trim, Infiniti logo, leather interiors and lavish equipment, Infiniti must be very hard for the Nissan bean counters to justify in today's savagely competitive luxury market. Especially when overall passenger car sales are declining. I’d love to know how shaky the Return On Investment (ROI) is? I'm sure the original brand concept was simply a case of Nissan 'saving face'. If Toyota was into the high end luxury passenger market, then we (Nissan) have to be there too. Because Infiniti sales have never seriously threatened the established players in the upper luxury sector, I am left to wonder why Nissan keeps sinking resources into a brand which is simply just dressed-up Nissans, with a different badge. 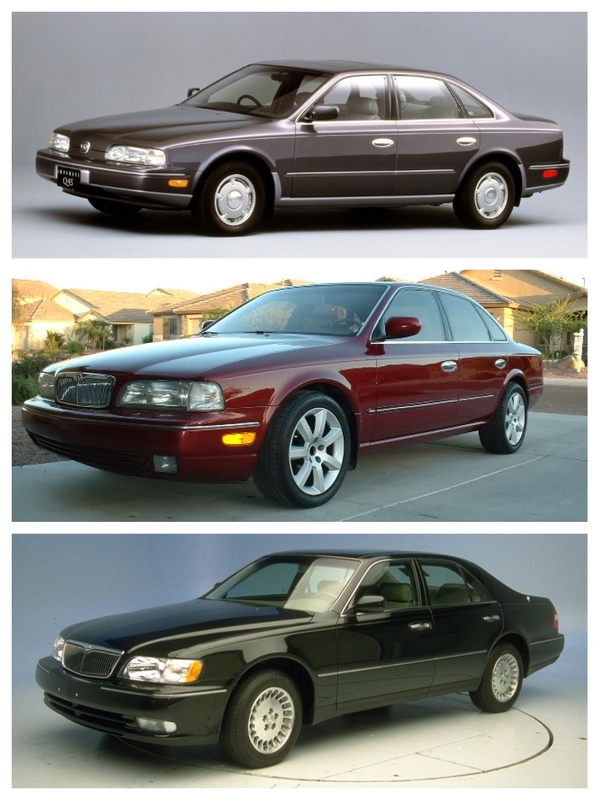 Also, over the years from 1989 to 2006 (right), the Infiniti Q45 ‘shape’ changed little. Nissan simply didn’t expend any decent investment resource into true ‘freshening’ of its ‘hero’ model – just tarted things up; a new grille here, a bit of chrome there, basically producing the same lump of ugly introduced in 1989. 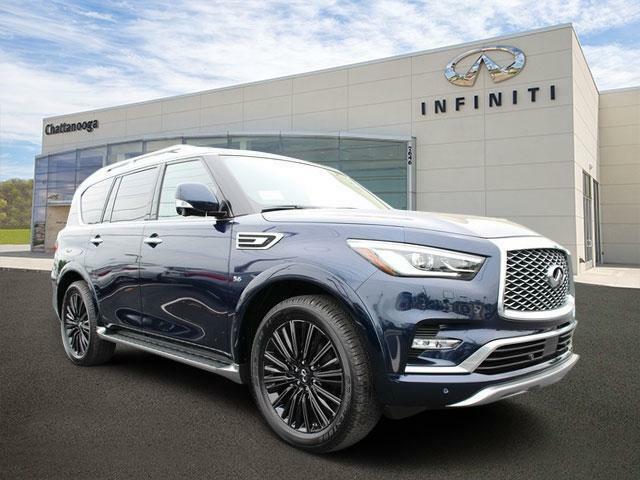 So, when Nissan decided Infiniti should have a luxury SUV, it produced this monument to gross. Nissan's waxing and waning enthusiasm in investing in the 'exclusive' Infiniti brand was never more noticeable than in 2006. Nissan replaced the Q45, with a car badged as the F50 (which also happened to be the Nissan Cima) – so much for exclusivity. Everything went quiet for six years, and in 2012 Nissan announced that the ‘Q’ moniker would return to all forthcoming Infiniti models. However, three years earlier (in 2009! ), Mark Igo, the General Manager of Infiniti North America said: "A new Q will make the brand better, but it is questionable whether it will be profitable". What? 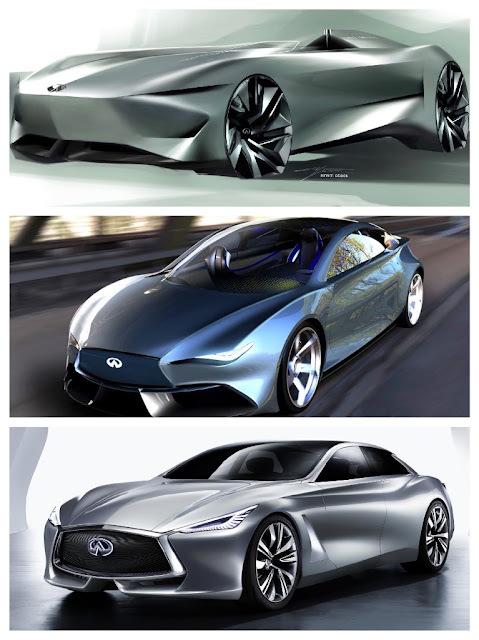 Nissan/Infiniti has released some concept ideas over the past few years, but they are ‘out there’, impractical, and highly doubtful to ever see production. It’s just enough to try and persuade the auto writers to possibly believe Infiniti is actually thinking about the future of the brand. These concepts were only shown in Japan and the USA, and as the bulk of automotive 'writers' these days are pimply-faced online contributors, they were impressed. When you examine it closely, Carlos Ghosn’s joint venture with Daimler AG (which led to the Q30 and QX30), was a genuine attempt to bring a unique identity to the brand, but of course that JV is now in jeopardy, since the new Nissan Board, led by Hiroto Saikawa baulked at paying Daimler AG ‘real money’ to bring these well-built, high-integrity cars to market. I will admit that Infiniti cars have sold reasonably well in the USA over the last 30 years, but the upper luxury sector in America is populated with fickle buyers who could not give a fig for brand loyalty. They just want to sample one once. After they’ve leased an Infiniti for a year, they move on. In the USA, buyers try a new competitor, just for the sake of showing that they are plugged-into whatever's 'new'. Then, once they've shown how contemporary they are, they move on to the next new 'thing'. 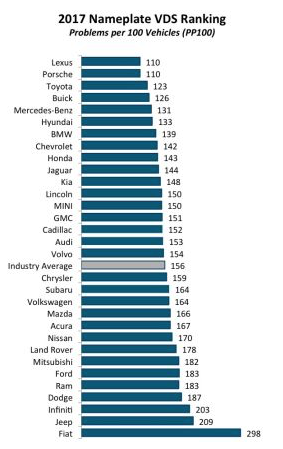 I’m told by one of my old friends in American dealer-land (who is a Jaguar, Cadillac and Infiniti dealer) that Infiniti’s buyer retention, or loyalty factor is among the lowest measured by J.D. Power in the Upper Luxury segment. In the 2017 J.D. Power Quality Survey, Infiniti rated badly. Occasionally it does better in the IQS (Initial Quality Study), but not repurchase. In a word, my best definition of Infiniti is, a joke! Still an Infiniti (especially a Q45) could make a great boat anchor.